Be sure to enjoy recreational amenities, including an outdoor pool, an outdoor tennis court, and a sauna. Additional amenities at this aparthotel include complimentary wireless Internet access, an arcade/game room, and a television in a common area. Enjoy a satisfying meal at Mirror serving guests of Narcissos Waterpark Resort . Wrap up your day with a drink at the poolside bar. Breakfast is available daily for a fee. Satisfy your appetite for lunch or dinner at Captain´s Table, a restaurant which specializes in international cuisine, or stay in and take advantage of the room service (during limited hours). Unwind at the end of the day with a drink at the bar/lounge or the poolside bar. A complimentary buffet breakfast is served daily from 8 AM to 10:30 AM. This complex is located in Protaras. The immediate vicinity offers guests links to the public transport network. Countless shops and restaurants are to be found in the vicinity and the beach is around 400 m away. Surrounded by gardens, this apartment complex is spread over 2 floors and has 88 apartments. The hotels facilities include a reception and safe (charges apply), a supermarket, a TV room, a car park, a garage and a children's play area. Dining options include an air-conditioned restaurant with terrace and a bar. The tasteful and cosy studios and apartments comprise a bathroom, a direct dial telephone, a combined living room/bedroom, a kitchenette, a minibar/ fridge, air conditioning (additional charge), central heating and a balcony or terrace. The apartments are similarly equipped and come with a separate bedroom. Leisure options include a pool with separate paddling area for children, a pool/ snack bar, a sun terrace with sun loungers and parasols, a sauna (additional charges) as well as the opportunity to play table tennis and billiards/ snooker (at an additional charge). A gym is also available. Guests may select breakfast from a buffet and dinner may be chosen from a set menu. Furthermore, it is possible to book a half-board stay. Featured amenities include an elevator (lift) and coffee/tea in a common area. Free self parking is available onsite. Vangelis Hotel Apartments are a group of 166 apartments, in which 134 are one bed room apartments, and 32 are studio apartments. These one bed room and studio apartments are fully furnished in a modern style to suit the needs of the travelers. On site there are sports and leisure facilities. These facilities are meant for the purpose of relaxation and comfort of the guests. The leisure facilities for the guests are a large outdoor swimming pool, a children paddle and an indoor swimming pool. A Tennis court is also available. Apart from the facilities provided in the Vangelis Hotel Apartments, there are few other services offered to the guests. 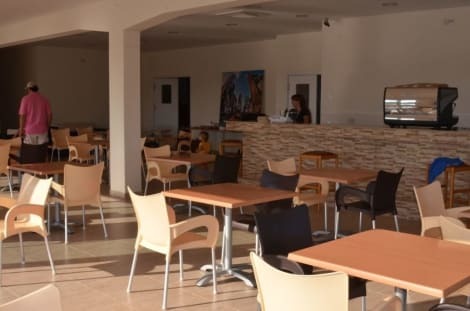 The services include Public rooms, 24 hours of reception service, Internet corner, and lounge with TV, games section or area, parking area, cocktail bar, restaurant and Wi-Fi facility. It is nicely positioned, surrounded by palm trees, amongst extensive grass lawns and beautiful well-kept gardens which run down to a safe beach with fine golden sand and blue crystal clear sea water. The beach has been awarded the blue flag. The whole concept is designed to give the spacious country side feeling although walking distance from the centre of the resort. Within 2 minutes walk, there are 2 more, smaller but beautiful, sandy beaches. The Famous ‘Fig Tree Bay’ beach, at the Resort centre, is about 1.5 km down the road (15 minutes walk). Supermarkets, Restaurants, Bars, Shops, Cafes, etc. can be found nearby and within walking distance. Various very interesting attractions, worthy of a visit also exist in the proximity. The rich variety of facilities, amenities and comforts available, the exceptional quality of our services, the excellent food, the friendly staff and fresh clean and warm family atmosphere that Cavo Maris Beach Hotel offers, will soon make you realise that, it is not only planned and organised for satisfying your expectations and design tastes, but it provides also everything needed so that your Holiday will be most enjoyable one. All in all our efforts are to develop the dreams and images you expect from your ideal Holiday. Make yourself at home in one of the 228 air-conditioned rooms featuring minibars and LCD televisions. Rooms have private balconies. Complimentary wireless Internet access keeps you connected, and satellite programming is available for your entertainment. Bathrooms have complimentary toiletries and bidets. Make yourself at home in one of the 225 air-conditioned rooms featuring minibars. Rooms have private furnished balconies or patios. Complimentary wireless Internet access keeps you connected, and satellite programming is available for your entertainment. Private bathrooms with shower/tub combinations feature jetted bathtubs and rainfall showerheads. Make yourself at home in one of the 173 air-conditioned rooms featuring refrigerators and minibars. Rooms have private balconies. Plasma televisions with satellite programming provide entertainment, while complimentary wireless Internet access keeps you connected. Private bathrooms with bathtubs or showers feature designer toiletries and hair dryers. When you stay at Sunrise Gardens Aparthotel in Protaras, you'll be near the beach, within a 5-minute walk of Fig Tree Bay and Sunrise Beach. 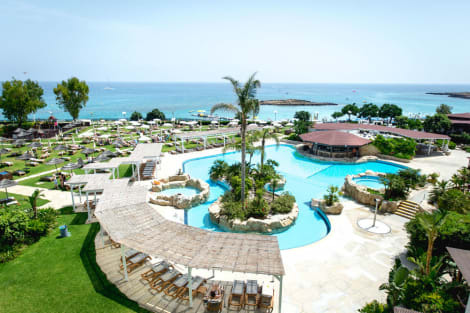 This 4-star hotel is 8.6 mi (13.8 km) from Nissi Beach and 3 mi (4.9 km) from Konnos Bay Beach. 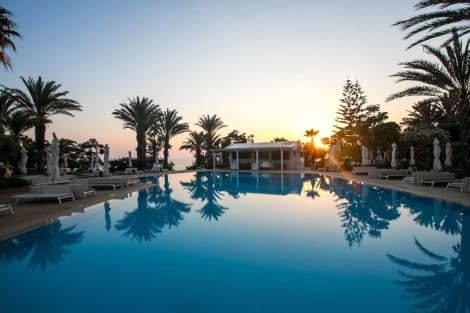 lastminute.com has a fantastic range of hotels in Paralimni, with everything from cheap hotels to luxurious five star accommodation available. We like to live up to our last minute name so remember you can book any one of our excellent Paralimni hotels up until midnight and stay the same night.